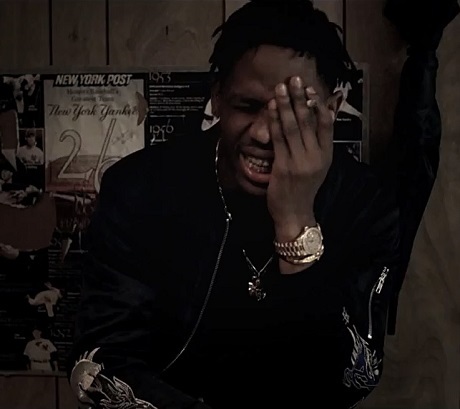 While stumbling around a nightmarish cityscape, Houston's Travi$ Scott weighs in on being a motherfucking monster in the hallucinogenic, self-directed new video for his Owl Pharaoh mixtape's "Uptown." Going by the clip, Scott's days start off with a spliff and a healthy barf, which maybe explains why he's so messed up as to not realize a young couple are getting mugged by a group of blanched-out skinheads the second he enters a convenience store. Foggy and faded, he later has a dinner date with a lit-up cutie in warehouse surrounded by said skinheads, who themselves are pumping iron and chopping meat. If that sounds like an ideal evening out to you, you can peep that scenario, as well as a side bit featuring A$AP Ferg rapping from the nega-verse, down in the player below.